Eating mindfully is without a doubt one of the most difficult habits to acquire, because by definition if you aren’t being mindful then you aren’t aware of it. For this reason I have recommended embedding triggers into your eating habits to remind yourself to pay attention to the act of eating. That way even if you are in a distracted or in a preoccupied state of mind you can be pulled out of it and brought back to awareness of the present moment for long enough to regain control of your attention. Why is this important, you ask? Let me count the ways. First, for most of us our eating habits are already deeply ingrained. That means that consistently choosing anything outside our normal habits requires awareness of our actions so we can intentionally choose a different course. Whether you have the habit of ordering a burger every time you go out with colleagues for lunch or eating the leftovers out of your kid’s lunchbox, mindless eating is often the instigator and reinforcer of your most unhealthy food habits. Second, for many of us food isn’t just a source of fuel or pleasure. Instead we use it to avoid uncomfortable thoughts and emotions. We eat to intentionally forget ourselves, and in these moments we almost never choose foods that will make us feel good afterward. Mindfulness is the first step in breaking this pattern of emotional eating, because it is only when you’re aware that you are acting out a self-defeating pattern that you have any chance of choosing a different path. Third, even if you have a habit of choosing real, unprocessed foods, overeating can still prevent you from achieving your health and weight loss goals. When you eat mindlessly you can easily fall prey to all the cues in your eating environment that trigger you to consume more than you need, including bigger plates, bright lights, fast music, ravenous dining partners and the duration of your favorite show. Mindful eating puts you back in touch with your own needs and desires, and can break the pattern of overeating. Fourth, you’ve almost certainly had an experience where you were so hungry and ate so fast that you hardly tasted your food. 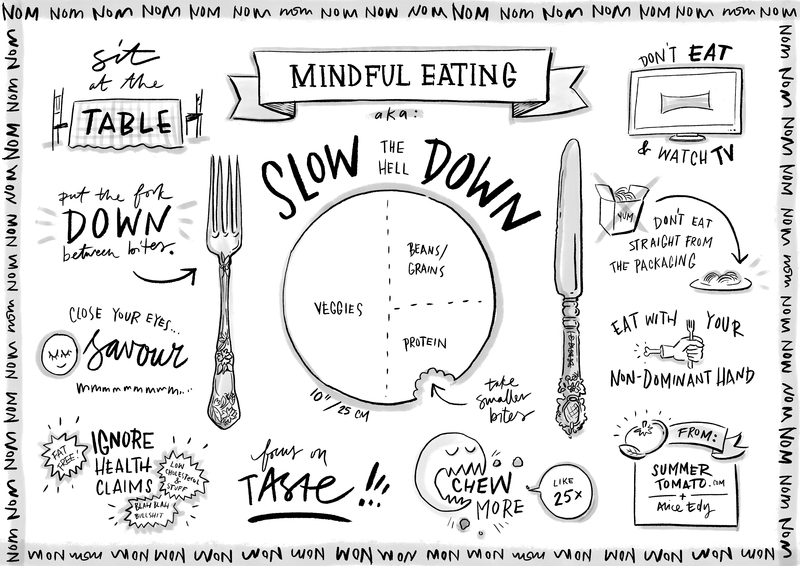 Mindful eating does the opposite by helping you slow down and really focus on the flavors, textures and delights that come from indulging your fifth sense. In other words, it actually makes your food taste better and be more satisfying, and people who learn mindful eating techniques report that they enjoy their food more and naturally eat less without feeling deprived. Mindful eating is the antidote to counting calories. Fifth, being mindful during the process of eating naturally puts you back in touch with your body. The more you focus on how different foods make you feel, the easier it is to make better choices. When you are aware of how your body reacts in different circumstances, over time you’ll learn the difference between true hunger, true fatigue, and emotional avoidance, and be able to respond accordingly. Without this knowledge you’ll likely continue to respond to all of these feelings with the same poor eating choices. Sixth, mindful eating inevitably results in better, more thorough chewing. Not only does this increase your feelings of satisfaction and fullness after a meal, it also makes it far easier to digest the food that you eat. When you switch from eating mostly processed foods to mostly Real Foods, it can be easy to overlook the extra chewing that is necessary to break down the additional fibers and proteins. This can lead to severe cramping and other digestive issues that are often completely resolved when mindful eating and chewing are adopted. With all these benefits you’d think it would be easy to remember to eat mindfully, but unfortunately that isn’t how our brains work. Understanding something intellectually isn’t enough to induce a state of mindfulness. For this reason mindful eating is one of the habits that Summer Tomato readers struggle with the most. 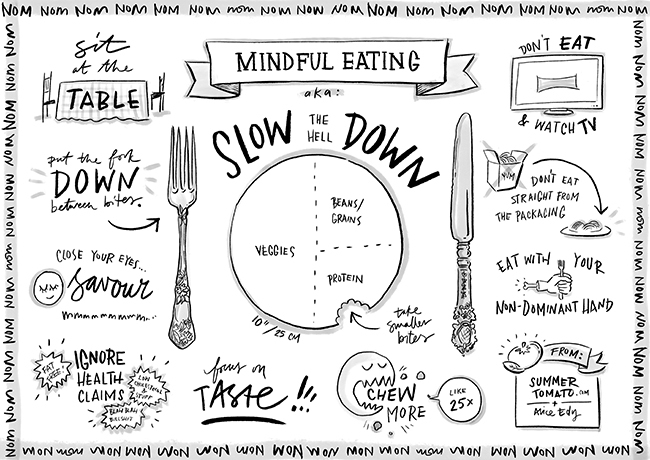 To help with this reader and foodist Alice Edy, an artist, letterer and illustrator based in Cape Town, South Africa designed this mindful eating placemat and offered to let me share it with you. The placemat can be printed cheaply on size A3 paper to get your mindful eating habit off the ground. To learn more about Alice you can check out her websites aliceedy.com & graphicrecording.co.za, and follow her on Instagram @aliceedy. Previous I Got My Nima Sensor! Now What Should I Test? ?